MATLAB Competition 2013 Organized by Department of Electronics Engineering Department of Electronics, on 6th of March 2013 at Mehran University to provide students with a platform to display their technical programming skills, logical understanding of the problems at their hand and to nurture the competitive spirit among the students. A total of 22 Teams and 44 students from the Faculty of Electrical, Electronics and Computer Engineering (FEECE) went to in a battle of intense programming skills at the MATLAB COMPETITION 2013. The venues for this competition were Cyber Interactive Lab and Digital signal Processing Lab at Department of Electronics where students were provided the latest issue of MATLAB version 8.0 R2012b with all its toolboxes to solve complex and convoluted problems related to their respective fields. The competition was based on 3 rounds, 1st Round was a Quiz round, 2nd Round, 15 Teams were given 5 very complex problems to make a function of and allotted 90 minutes to do so.3rd and Final Round of the Competition, the students were given an elusive task to choose a category and then solve a Graphic User Interface (GUI) based design task in 30 minutes. 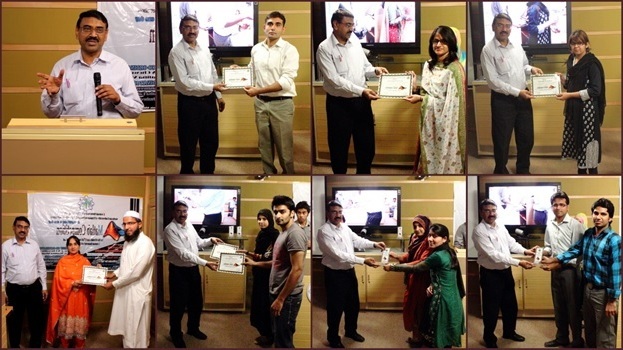 Winners were awarded their winning shields in the closing ceremony held at video conferencing hall, which was hosted by Faraz Shaikh. 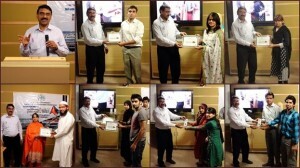 Dean FEECE Dr. Bhawani Shankar Chaudhry and Chairperson of Electronics Department Dr. Wajiha Shah did the honors of presenting the shields to the winner and runner ups of the event. In his closing remarks Dr. Bhawani Shankar Chaudhary hailed the efforts of the Coordinators and organizers for the competition and promised his support for all their future endeavors.